The Mermaid Life: SLEEK PRODUCTS REVIEW - POUT PAINTS IN PEEK-A-BLOO, CLOUD 9 AND PINK UP. DIP IT EYELINER IN PASTEL GREEN, GOLD AND BLACK. 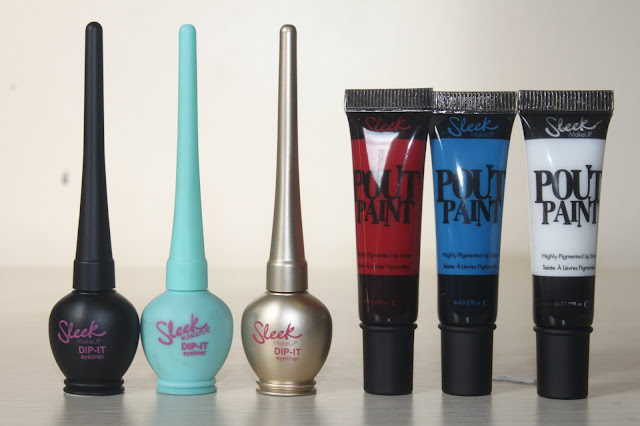 SLEEK PRODUCTS REVIEW - POUT PAINTS IN PEEK-A-BLOO, CLOUD 9 AND PINK UP. 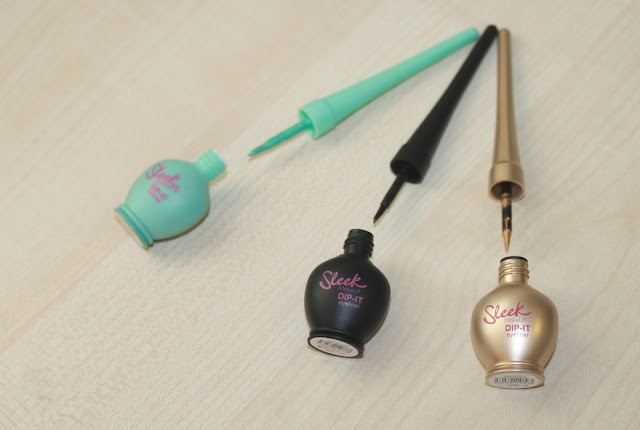 DIP IT EYELINER IN PASTEL GREEN, GOLD AND BLACK. About a month ago I was asked to do the makeup for a Musical, Pippin. With crazy colours and mental make up I made this an excuse to find a few more bright make up essentials to add to my kit. I had been meaning to get my eager hands on the Sleek Pout Paints for a while but never got round to it, and always went to Mac for lipsticks. 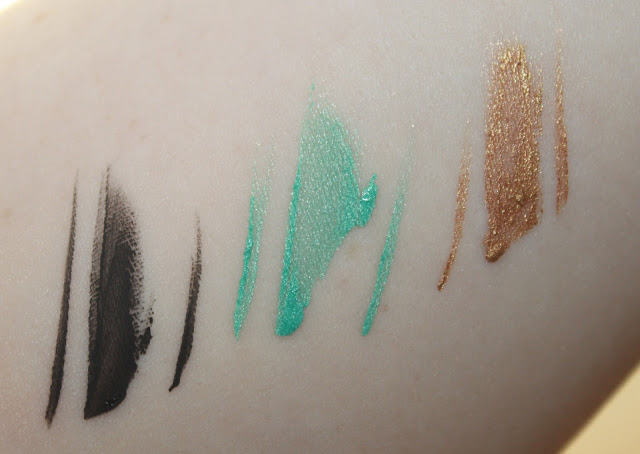 I was also drawn to the gorgeous Pastel Green Dip-It eyeliner, so I obviously needed that too. First we have the Pout Paints, my new obsession. Of course I had to pick up Peek-A-Boo, a true blue shade. I then added Pin-Up, a appropriately named red, and Cloud 9 a bright white. The one thing I really don't like about these is the taste and smell. It really reminds me of rubber gloves. Or is that just me? The application on a few were also a bit tricky. Also, these don't set like most lipsticks which is a big issue for me, so be careful not to smudge! Let's break the colours down. 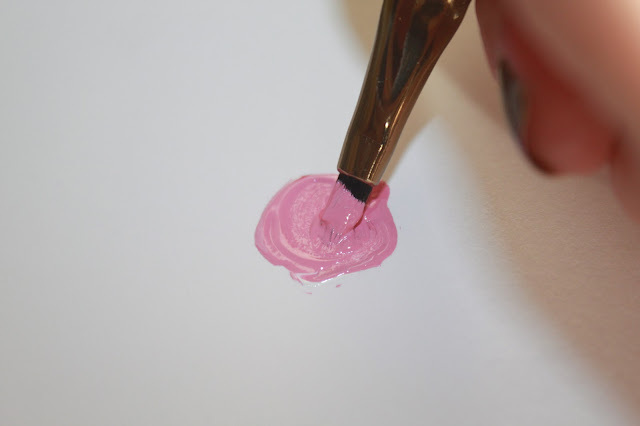 a little lip brush to apply! Peek-A-Bloo is a bright blue shade which I needed! 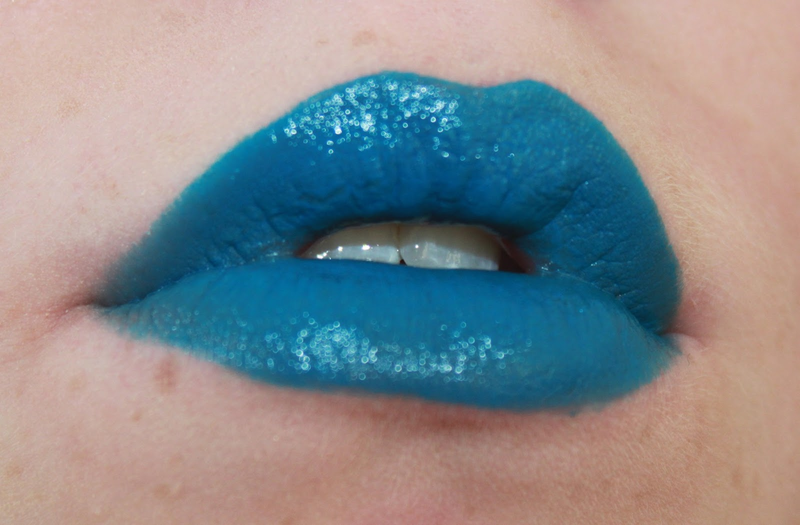 It was perfect for the stage make up of Pippin, and people told me how good the blue lips looked. It really stood out on stage which was perfect. Application of this product wasn't too bad. 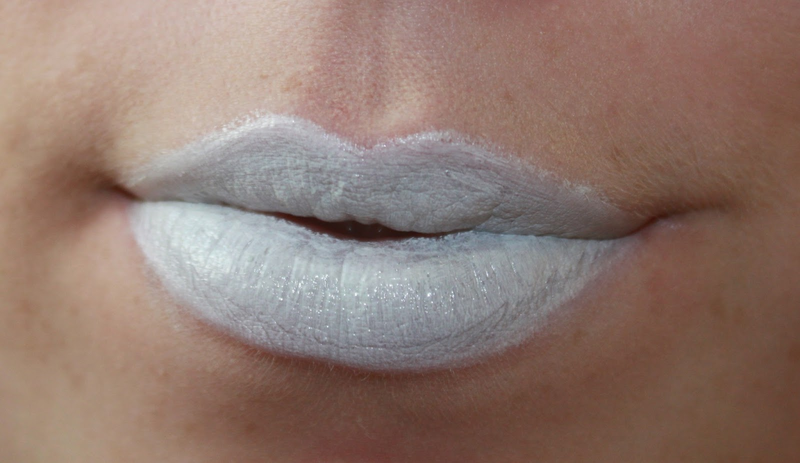 After using a brush to apply the product to the lips I had to work the product in well to avoid streaks. Like all the Pout Paints it has a not-gloss-but-not-lipstick feel. It's more of a very high pigmented thicker gloss, that's not overly sticky. I was so impressed with this shade and how good the colour was. It's also quite glossy, but not as glossy as Pin Up is. I also added this colour, Cloud 9 and Pin Up to create a violet shade which looked so lovely. Cloud 9 is a bright white. This was a little tricky to apply due to it's pigment, and as you can see the lipstick isn't as evenly applied as I would liked it to have been. However, I'd never wear the white by itself so I wasn't too fussed, but for the purpose of the review the white wasn't as pigmented as I wanted. I found it was a little thicker compared to Peek-A-Bloo. I use the white to make more pastel colours, or get creative with gradients. Cloud 9 is still a glossy shade, but the least out of the lot. Just let down by how streaky it looks by itself. Pin Up was my star buy. When I tried it on, I was completely in love. 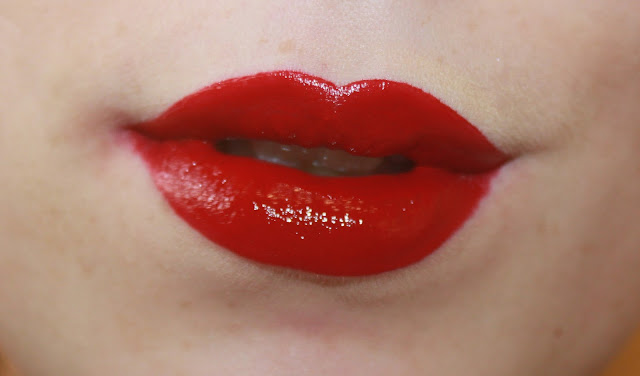 The bright blood red shade looks stunning, and is crazily pigmented. I'm a sucker for a red lipstick, so I was so impressed with how this looked. It looks really good just over my natural lip line to create a more plump look. This is a glossy red - And I normally stay very clear from gloss - But I just love how this looks. There was also only a teeny bit of bleeding, so a thumbs up from me. 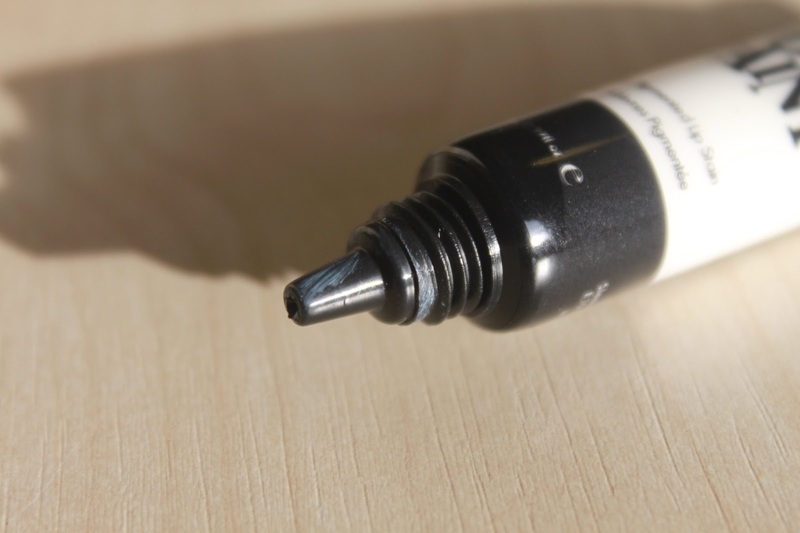 A dream to apply with a brush, easy application and spot on with the consistency. What's not to love? I can't explain enough how much I love this! My new favourite red for sure. Move over Mac's Riri Woo, there's a better red on the block. 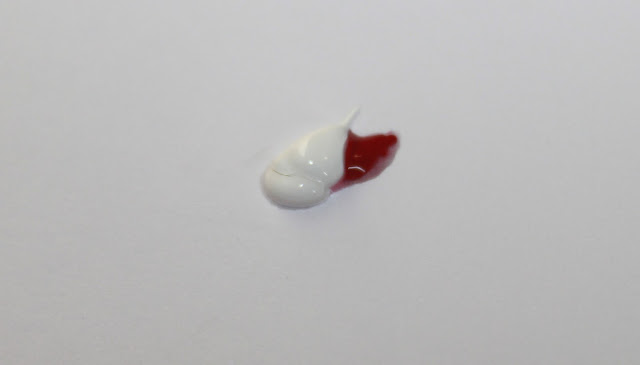 The thing I found with these Pout Paints was how it will go on your teeth for the first few moments off application, but after blotting the inner part of your lips and a little wear, this does stop happening. That aside I found the Pout Paints really long wearing. Let's get creative. 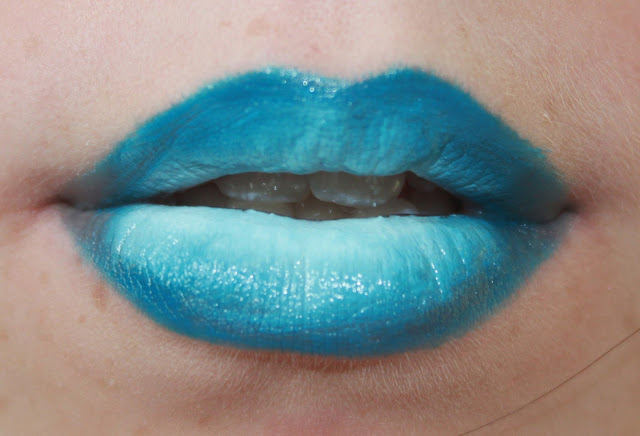 With the Peek-A-Bloo all over and Cloud 9 in the inner lips, you can create a ombre effect. The styles are endless with these Pout Paints. Mix it up a bit to choose a colour for any mood or occasion. L-R, Pastel Green, Black and Gold. 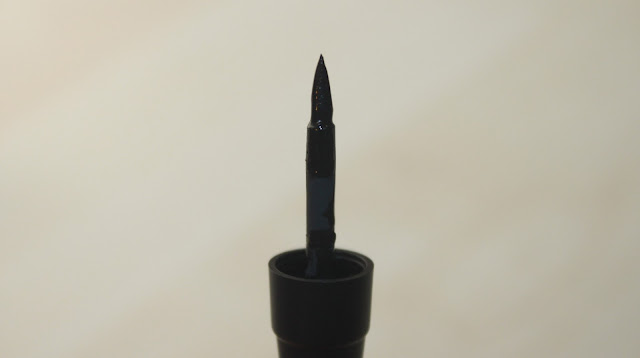 These Dip-It Eyeliner from Sleek are pretty good. I love the gorgeous gold and I find that the pigment in that beauty is spot on. However, Black and Pastel Green let me down slightly. Pastel Green is a pretty mint green with a slight hint of shimmer, but wasn't as pigmented as I'd like and found it a little streaky to apply. But once getting the grips of it, I could achieve a pretty spring-time look. I love that the Black shade is completely matte, but it lacked in intensity. However, I reach for it a lot for a smokey eye as it just suits a smokey look perfectly. The staying power on all of these are pretty good, and last the day, although with teary eyes or oily eyelids these can smudge slightly. These are handy for my kit, but the bottom note is that I probably wont repurchase these again, but there are worse eyeliners out there on the high street - So these aren't that bad. Overall, my best buy was the Pout Paints, especially the beautiful Pin Up. Grab the Pout Paints for £4.99 each online with the Dip-It Eyeliners for £4.49. Or grab them at your nearest Superdrug. I have some Pout Paints as well and have been putting off trying them. I might just have a play with them. LOVE that red! 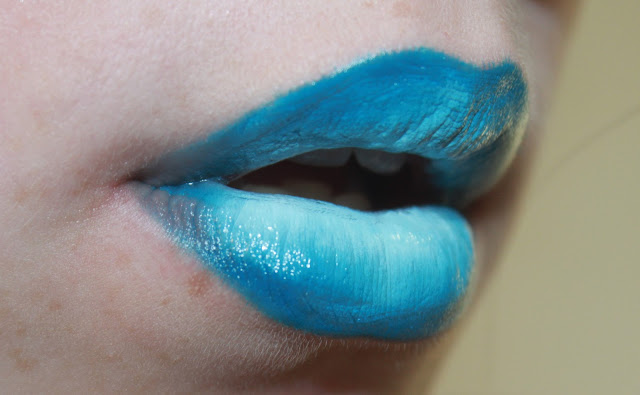 Ooh the pout paints look really interesting - I love the blue ombre effect!